His uncle’s advice, “Instead of expecting or chasing good things in life, create good where you are and from what you have,” is the mantra that has helped Ganesh Jivani, MD of Matrix Comsec, come a long way and become a successful entrepreneur. 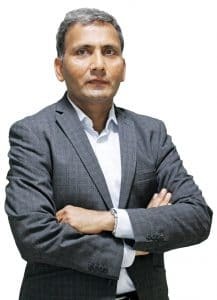 In a candid conversation with Baishakhi Dutta, senior journalist for Electronics Bazaar, he shares his invigorating 25-year journey in the security and telecommunications industry. I was born and brought up in a small, remote village near Morbi, Gujarat, into a farming family. My family consisted of my grandparents, uncle, aunt, parents, siblings and cousins. I had an idyllic childhood, playing in the fields and sleeping under the stars. The economy and livelihood of our entire village was dependent on agriculture, which was the only mode of sustenance. During those days, droughts were very common, leading to serious scarcity of water and food. For us, the rain brought happiness. But when the rains played truant, it was a fight for survival till the next monsoon season. I grew up mostly watching my grandparents and later, my parents always worrying about the rains and working hard to feed the family. My father realised that education was the key to prosperity and made sure I focused on my studies right from the beginning. Starting from my primary education up to the seventh grade, I attended my village school which had only two classrooms and three teachers. We did not have a high school in my village. So, we used to walk to a nearby village for the eighth and ninth grades. I was one of the few lucky boys to be sent by my parents to Rajkot for higher secondary education (10th to 12th grades). After completing my schooling, I did my BE in computer science at the MS University of Baroda, Vadodara—a course I completed in 1986. There were 20 students in my computer engineering class. Most of my classmates came from English medium schools, while a few of us had studied in Gujarati medium schools. At the time, we did not understand or speak English. We could only read and write it a little bit, since we had studied English as a language in our school days. We all struggled a lot in the first few semesters. Those were very tough days and we went through all kinds of funny and tragic incidents. To be honest, I flunked two subjects in the first semester itself. Fortunately for me, all my friends were very studious and hardworking. Their infectious energy and commitment motivated me to work hard and prove myself. My father had only studied up to the third standard and my mother never went to any school. They were farmers and have now retired and live with us in Vadodara. I am the eldest of four siblings. My sister, Vijya has married a farmer and lives with her family in a village near Morbi. My second brother, Dhiraj is a distributor for Matrix in Surat and the youngest, Ramesh, works for Matrix in R&D. I met my wife, Anjali while studying for my engineering degree—she was studying for a MCA at the same college. After our marriage, she joined the same department as a lecturer. Later, she completed her PhD in data mining and is now the head of the department. We have two children. Our son, Devavrat, is working on his PhD in computer vision at RPI, Troy, New York. Our daughter completed her B. Tech in computer science, and is now planning to do a masters in the USA. The immense energy and commitment of my friends motivated me to work hard and prove myself. Usually, I prefer reading. I also enjoy watching television and movies. I play tennis every day for exercise and fitness. I also enjoy running and have completed two to three half marathons in Vadodara. I enjoy reading all kinds of books on topics like history, management, etc, as well as autobiographies and thrillers. Though I don’t know too much about Indian classical music, I enjoy listening to it sometimes. It is amazing to see how seemingly different people are all the same at the core. I respect people coming from diverse backgrounds and enjoy working with them. I can easily connect with simple and transparent people. I never had the luxury of choosing my work environment. My uncle taught me something that I remind myself about almost every day. He said, “Instead of expecting or chasing good things in life, create good where you are and from what you have.” In simple words, I believe that instead of blaming external factors, I should take ownership of my life and the situations around me and try to make the best out of whatever I have. This applies to everything— whether it is the environment, infrastructure or people. I am in the field of telecommunications and security mainly due to my educational background and my work experience. Before starting my own company, I worked on many telecom projects. In addition to creating wealth for oneself, entrepreneurs cannot sustain and grow in isolation and, therefore, do end up contributing to the industry and the community. Direct and indirect employment, intellectual property, skills development and infrastructure are byproducts of all businesses. From the community and government standpoint, direct/indirect taxes, import substitution and forex earnings are derivatives. Specific to Matrix, the company has directly employed and trained more than 1,000 engineers. Matrix is also proud of its large distribution and systems integrator community, which in turn invests in infrastructure, equipment, manpower, training, etc. In our own small way, we have proved that Indian companies can design and manufacture world-class products. Today’s managers cannot afford to stick to one fixed management style. We need to be more open, flexible and agile. Having said this, individuals and organisations do place an emphasis on their few chosen core values, more than on others. That’s what differentiates them. Our emphasis is on innovation, quality and processes in everything we do. I pursue process driven management, whereby the ends cannot justify the means. I am an introvert and would love to improve on my public speaking capabilities. At times, I end up micro-managing people, and would like to learn the art and science of delegation. I work hard to practice simplicity, transparency and sincerity in my professional field. Innovation and scaling up businesses are my passions. After consolidating the business in India, we decided to explore the international markets. This proved to be an eye-opener and also a turning point in our business. On the personal front, meeting my wife was the turning point in my life. Winning more than 700,000 customers in India and the world over in diverse sectors like manufacturing, retail, services, BFSI, hospitality, health, education, defence, government and many others. Designing 50 different technology products that meet the needs of modern enterprise customers. Matrix products are sold in more than 50 countries including USA, Canada, Germany, Italy, Portugal, Spain, Australia, Thailand, Vietnam, Philippines, UAE, Saudi Arabia, South Africa, etc. Creating a strong network of 1,000+ systems integrators and channel partners selling Matrix products the world over. Matrix products have won international awards for design and aesthetics. These include iF Germany, Red Dot Singapore, GOOD Design Japan and India Design Mark. Matrix products meet international standards such as CE, FCC, RoHS and others. I vividly remember some of my interactions with our customers. I was once in a meeting with a customer in Delhi, to discuss a new product and was accompanied by our distributor. The customer did not like the product at all. But, instead of rejecting us, he went out of his way to help by suggesting various methods to improve the product. In fact, not only did he spend a few hours on this, but also called his technical manager and his suppliers to help us improve the product. We have all heard about customer care. But, when world class products are available easily, it is not common for a customer to care for his supplier! I have been fortunate to come across many inspiring people in my everyday life. At the end of the day, we are all products of our times and circumstances. Instead of blindly following anyone, I attempt to understand their situation, motivations and behaviour. I get inspired by those specific instances. I have a counter-question: Can we motivate people? Honestly, I find it very difficult to motivate people. When we work with intelligent and self-driven people, they don’t need motivation from us. Instead, I focus on creating influence by communicating what exactly we are trying to achieve, why we are doing it and how we should go about it. I rely more on sharing my views on the opportunities, the challenges, the strategies we should follow and the execution plans. I worked for about four years as an R&D engineer in Vadodara, Gujarat, before establishing Matrix. I took a ₹ 55,000 loan from SBI to buy my first computer, and founded Matrix in 1992 from the small living room of my rented apartment. Back then, Matrix was a one-man company offering hardware and software design services. After about two years, my classmate Dhirendra Savla joined me, and we designed a PBX on our own. It was our first product. Subsequently, we added manufacturing and marketing to our core design activities and then emerged as a standalone product company. Later additions in our product portfolio included IP-PBX, media gateways, unified communications, access control, time-attendance and IP video surveillance. Today, Matrix is a company of over 500 people with more than 50 products sold in more than 50 countries including USA, Germany, Spain, Portugal, Italy, Australia, Argentina, UAE, Saudi Arabia, South Africa, Thailand and many others. Matrix has identified three technology domains – IP video surveillance, access control/time-attendance and telecom. All its solutions target the same set of customers – modern enterprises, SMEs and SMBs. We are busy developing cutting-edge technologies and solutions, and taking them to the international and domestic markets. It is a journey we started 25 years ago and have been enjoying it so far. I need to spend more time on people, on delegating, on processes, building an organisational culture and infrastructure. On the personal front, I would like to take more vacations with my family and travel. There are many interesting places in this world that I would love to visit, and many amazing people I would live to meet. I am enjoying my work. From this perspective, it is important for me to improve what we are already pursuing rather than spreading ourselves too thin while going after new opportunities. Five years down the line, I see myself as an accomplished businessman with improved capabilities in risk-taking, team building, delegation and building stronger processes. I do want to spend more time with my family and travel to different parts of the world. On the business front, our vision is to build Matrix into a world-class security and telecom solutions and services company operating all over the globe. We will strive to do better in this direction. Advice to budding entrepreneurs: Nurturing an idea or a product requires missionary zeal and commitment. Perseverance and connecting with people are vital. Entrepreneurship is a very thrilling, demanding and rewarding career, where you are your own boss and cannot blame anyone else for the results! Next articleIs the Indian solar sector at the crossroads?